Industrial and commercial cleaning are two industries that overlap. So, if you are the owner of a premise, you may need to decide whether to employ industrial cleaning contractors or not. Industrial cleaning can include any type of building that falls within the industrial sector, such as a factory setting. Industrial cleaning contractors can clean your premise, both internally and externally. So, in this article we are going to take a look at some of the most usual and unusual industries where industrial cleaning is required. One of the most specialist types of industrial cleaning is that of nuclear explosive plants. But, like all working environments, a nuclear energy facility needs cleaning on a regular basis. Radio telescopes and even submarine cleaning fall under the category of industrial cleaning; so let’s take a look at some of the most common types of industrial cleaning, and some of the rarer. One of the most common types of environment where industrial cleaning is required is in manufacturing and production. This could be a simple factor floor, or something more complex such as a precision engineering plan. Plant rooms and power stations also require industrial cleaning that cannot be carried out by standard commercial cleaning companies. Pharmaceutical environments also require industrial cleaning by very specialist cleaners. Anything from a doctor to a dentist surgery could be classified as such or any environment where there are pharmaceutical products. A dentist surgery needs very specific cleaning, both for devices that are used more than once such as the dentist drill, to the proper disposal of single use products such as needles. Food production areas also require industrial cleaning contractors. This could be an industrial sized kitchen in a bar or restaurant, or something as large as a brewery. Any environment where food is handled needs to be cleaned to extremely high levels, ready for any on the spot inspections. Asides public environments or workplaces where members of the public are employees, government facilities also need cleaning. This could be a local police station, a town hall office, or a high security MOD environment. In these circumstances the vetting of the industrial cleaning contractors used is highly essential. The same could be said for nuclear environments. You will find nuclear decommissioning plants across the UK, and levels of security are extremely strict. Each and every individual who enters or exits the premise is checked and often searched. Industrial cleaning doesn’t always have to be on a large scale. It can in fact mean cleaning in confined spaces and environments. This type of cleaning includes tanks and vessels, and other similar dangerous environments. Lastly, you may require the services of industrial cleaning contractors for large scale cleaning. Some examples of such cleaning would be railways, dockyards, and refineries. 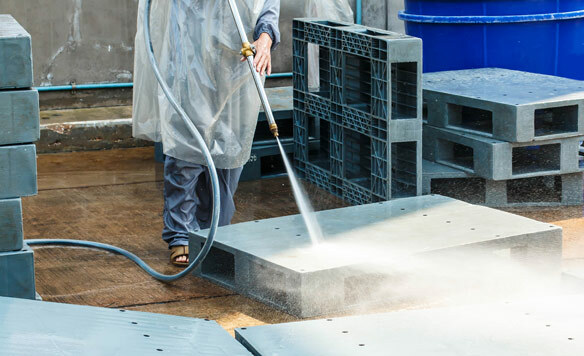 Exterior building cleaning would also fall under this category, and is a very common type of industrial cleaning that is frequently ordered by owners of industrial units. Industrial cleaning therefore does not just mean cleaning on a larger scale than that of domestic or commercial cleaning projects. It can mean the cleaning of a wide variety of very specialist premises. All types of workplace, no matter what they are need cleaning. This could be something as simple as a factory floor or a large hotel kitchen. Or it could mean a situation where there are very high levels of security in place such as in government or armed forces units. Selecting industrial cleaning contractors is something that should be done with much care. Not only do you need to make sure that the company of your choice is equipped and capable of cleaning with experience in the area; you also need to carry out checks on the company. Inviting a cleaning company into your premise is a risk that you need to take. Your premise needs to be cleaned. But, you can reduce the risk by vetting the company you choose for your industrial cleaning. Check out their portfolio to see who their clients are. If you see that they already clean for government facilities or other high risk environments, you can be sure that you are contracting a cleaning team that you can trust.